15 gallons split three ways onto cherries and raspberries, dry hops, and pinot noir concentrate! I t’s said that the two best days of a boat owners life is the day they buy their boat and the day they sell it. I’m a little ashamed to admit that’s how I feel about my 15-gallon Dad’s Hat Rye Whiskey (now sour) barrel at home. I got it as a gift five years ago and was pumped, I brewed three straight days to fill it. That initial thrill slowly faded each year I had to empty it knowing I would have to rebrew 15-gallons of beer, bottle, keg, fruit, or whatever I’m planned on doing to package the beer. But, despite the work and patience, cracking a bottle that’s a few years old is always worth the effort! At Sapwood Cellars, I’ve become known as just the hop guy. Customers will come in and ask me if I’m the hop guy or the sour guy. The thing is, I’m much more than just the hop guy; I have feelings, ambitions, and even some sour beer getting funky at home! Thankfully, I made strides towards becoming more than just a haze maker with the 2017 brew (2018 barrel drop) mixed fermented sours, particularly with the cherry and raspberry portion! A great combination of science, pro dregs from a trip to Belgium, luck, and lots of fruit produced one of my favorite batches to date. A little background on my barrel, I’ve had five beers go through it and it’s slowly losing some of the strong oak and whiskey character with each consecutive batch. 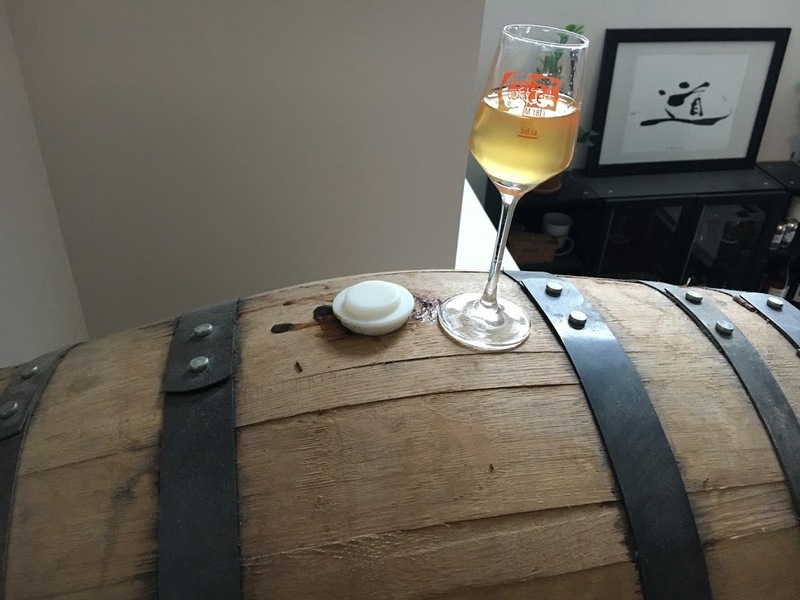 Because I was told not to put a pale(ish) beer through the barrel first, I decided to put a pale(ish) beer through the barrel first. People drink straight whiskey, right? After the Old Ale-like beer, I started brewing a dark saison each year, which was really just a saison with a little bit of midnight wheat for coloring and flaked quinoa and flaked rye. I added only a few bottle dregs from my favorite bottles over those years and I was always happy with the results, but most of the bottles I open today have very subtle funk and medium to low acidity (these batches often taste like a tart purple popsicle to me). Once you introduce bacteria to a barrel, it’s sticking around making a permanent home for itself. Because of this, I wanted my barrel to have meaningful and tasty bugs. So, when traveling around Lambic Land two years ago with my good friend Sean Gugger, I took sanitized vials with me everywhere I went during the trip. Any of the bottles that I really enjoyed, I’d swirl up the dregs in the bottle and dump them into my vial to fly back home to build up with starter wort. I typically went for younger lambic beers without fruit, thinking I was getting a fresher batch of yeast/bacteria and tasting a beer without the fruit gives you a better idea of what the bugs are actually doing to the beer. By the way, I’m super pumped for Sean and all craft beer fans living in and around Brooklyn, NY because he’ll be opening Shadow Brewing there soon! 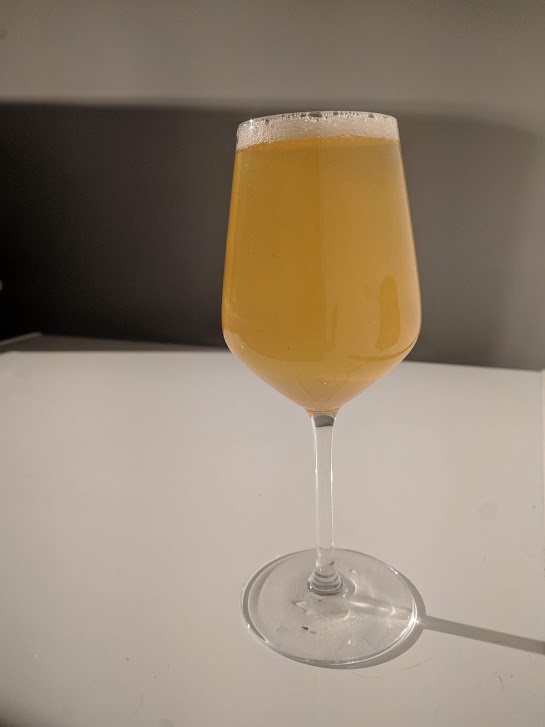 For the beer in this post, I brewed a pale base and fermented it with Omega HotHead Ale yeast. I like the fact that the HotHead strain doesn’t require any fermentation temperature control, which is great when you have three different carboys fermenting to fill the barrel (and likely not that much space in a home fermentation chamber). I also like the fruitier character the strain can provide. Although the primary yeast characteristics will mostly disappear with a year aging in a barrel with bacteria, I don’t mind the potential of a fruit-like funk as a result! After a year aging in the barrel, I racked four gallons onto raspberries/cherries, five gallons spent time with pinot noir concentrate, and the remaining five gallons was dry hopped with Hallertau Blanc (only during the time it took to bottle it). 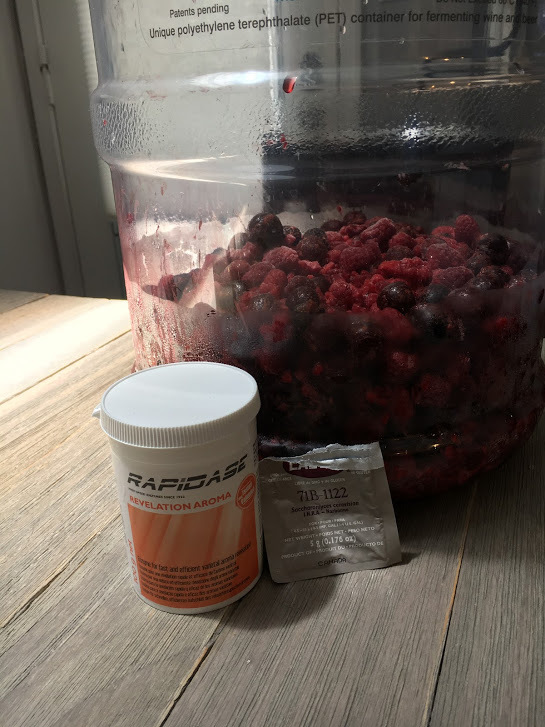 Cherry and Raspberry Portion – 4 gallons racked out of the barrel onto four pounds of frozen whole dark sweet cherries and four pounds of frozen raspberries with .5 grams of Rapidase Revelation Aroma and 2 grams of Lavlin 71B-122. After a month, I racked to a bottling keg with water/sugar solution to reach approximately 2.4 volumes of CO2. Hallertau Blanc Portion – 5 gallons racked out of the barrel into the bottling keg with 85 grams of Hallertau blanc hops for only four hours of contact time with 2 grams of Lavlin 71B-122 and sugar water solution to reach approximately 2.4 volumes of carbonation. Pinot Noir Portion – 5 gallons racked into a keg with 1-gallon Pinot Noir, Vintner’s Reserve wine concentrate kit and 2 grams of Lavlin 71B-122 with a spunding valve set to 4-5 PSI. Spunding valve was removed after a month and allowed to partially carbonated until being put on gas to carbonate the rest of the way and serve. 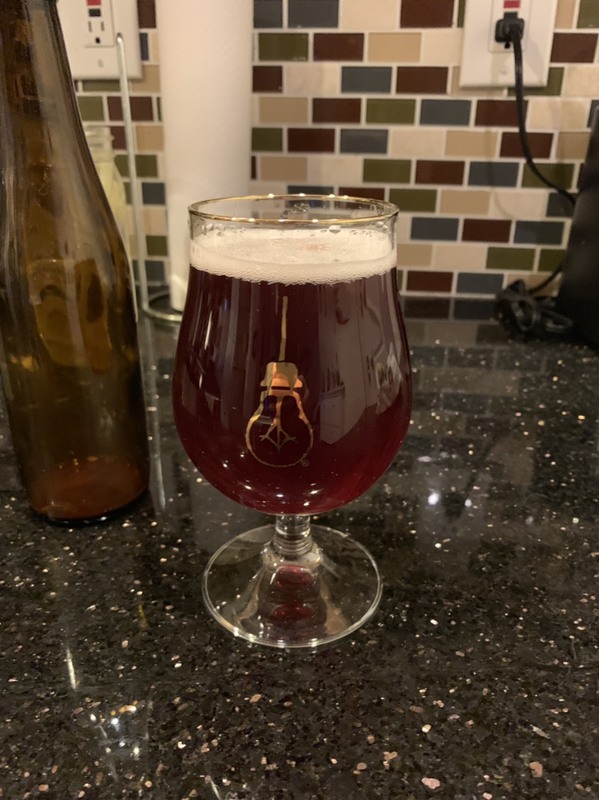 Cherry and Raspberry – Starting with the raspberries and a cherry portion of the barrel, I incorporate some of the science I came across writing a book on hoppy beers (hoping for a April 2019 release). In one particular study, a cherry beer had a fruiter flavor, both in sensory trials and in measured compounds in lab results due to bioflavoring when in the presence of a commercial beta-glucosidase enzyme (and even higher in B. anomalus strain). 1 Although the lower pH of the sour beer can inhibit the enzyme, I decide to give it a shot anyway, I added .5 grams of Revelation Aroma which can release bound glycosylated precursors on fruit (mainly skins). I also added 1 gram of wine yeast (71B-1122) which is also tested to produce the beta-glucosidase enzyme for bioflavoring. In addition to potential enhanced jammy characteristics from bioflavoring, I also like adding yeast to the aged beer when the fruit is introduced to ensure the refermentation is done with healthy fresh yeast. I let the barrel aged beer, wine yeast, and enzyme sit for a month before bottling. This beer to me has one of those wow aromas! A great mix of slightly fruity-funk, but with loads of jammy raspberry and cherry character. Raspberry jelly stands out the most to me, but the cherries combines to remind me a bit of the liquid at the bottom of a cherry Mr Freeze! There is subtle oak and almond character which helps add to the fullness of the beer, but the fruit is dominant. One of my friends that has an amazing palate (see what I’m doing here) described it as Rosé de Gambrinus-like, I’m not saying it’s even close to that caliber, but I’ll take the compliment! Although, it does contain a good bit of Cantillon dregs from my vials! It’s impossible to say what exactly the wine yeast and enzyme are contributing to the beer without a comparison, but it’s hard to argue with the results! At 2 pounds of fruit per gallon, there’s obviously going to be a strong fruit character, but maybe the enzyme and wine yeast was still able to do some work on the skins despite the low sugar and pH environment to unleash some additional flavors. 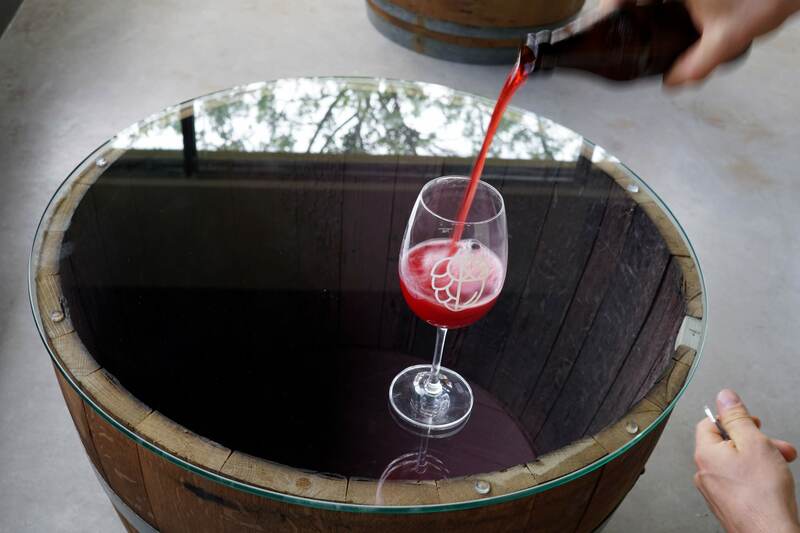 Pinot Noir Concentrate – For the five gallons of Pinot Noir concentrate, I purchased Pinot Noir, Vintner’s Reserve at Maryland Homebrew sized for a 1-gallon batch of wine and added the entire amount to a keg before racking in the barrel aged beer. The addition of Pinot Noir concentrate transformed the pale straw base beer into a dark ruby red! Another jammy (but to a lesser extent) sour barrel aged beer resulted, which was really reminiscent of wine. Almost like a fun natural wine with a little bit of fermentation character. I get lots of blackberry notes with a restrained musty funk. There is a slight medicinal cough medicine thing I could live without though. I wish I could of pushed the fresh wine grape character up a notch, which maybe could be done with actual grapes and their skins instead of using a concentrate (which smelled a little bit like prunes to me out of the bag). Overall the beer is pretty good, but seems like it could have been better! Hallertau Blanc Bottling Day Dry Hops – Because dry hops can extract so quickly, I thought it would be fun to dry hop 5-gallons of the barrel base with Hallertau Blanc hops just for the time I spent bottling the beer. To try and avoid any oxygen pickup when bottling (to avoid THP flavor production) I bottle with my kegerator pushing everything with C02. For this beer, I added the dry hops to a keg (with a filter) along with the bottling sugar solution. I purged the keg a handful of times up to 15 PSI and then racked the beer directly from the barrel into the keg. From there, I purged each bottle with CO2 and then filled the bottles through the tap with a growler filler hose going into the bottle filling bottom up. Overall, the hops were on the beer (under pressure) for 4 hours before going into bottles. I would gently swirl the keg every so often to encourage some extraction as I dealt with the other 10 gallons from the barrel. One thing I didn’t consider was that the hops might absorb the sugar solution and prevent it from being evenly distributed throughout the beer as it filled. This is exactly what happened as most of the bottles lack carbonation, but some seemed to carbonated perfectly. It really adds some excitement (or disappointment) to opening a bottle! Despite a short time on the beer, the hops do come through a little, bringing a faint white wine grape aroma. The dominate flavor is a lemon forward funk that works nicely with the Hallertau blanc. The uncarbonated beers are more like a funky chardonnay, but flat enough you lose interest in it quickly. The carbonated ones are much bolder and enjoyable. There’s firm acidity, but it’s not over the top. I’ll be interested to see how this slight hop character lasts with another year or so in the bottle. Next time I think I would carefully add the hops after I fill the keg with beer so the sugar mixes in good, then purge the keg a few times before bottling. The barrel was refilled the same day it was emptied with a Flanders Red base from one of my favorite Mad Fermentationist beers! 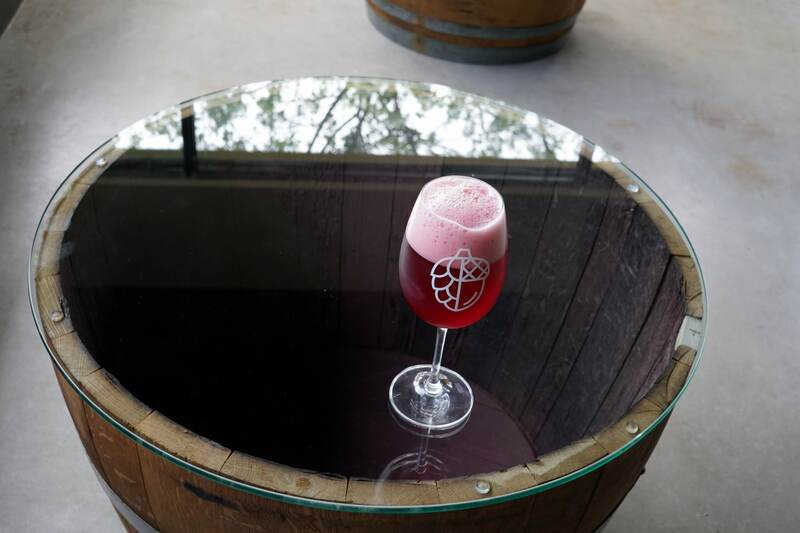 This time the beer will get a strong dose of Washing cabernet savugion grapes (with skins), tart and sweet cherries, and the other split on a mix of wine grapes and cherries! All three carboys will also get the enzyme and 71B-1122 wine yeast because of the success with the raspberry and cherry beer from this post! Vervoort, Y., Herrera-Malaver, B., Mertens, S., Medina, V. G., Duitama, J., Michiels, L., . . . Verstrepen, K. J. (2016). Characterization of the recombinant Brettanomyces anomalus β-glucosidase and its potential for bioflavoring. J Appl Microbiol Journal of Applied Microbiology. doi:10.1111/jam.13200. That’s true, but what if you want a bottle within the first couple of months?! Nice post. Interesting stuff about β-glucosidase. Might have to give that a try. Looking forward to the book release. Any suggestions on where to get Rapidase Revelation Aroma? I have been hunting the Internet and am struggling to find it in the States without having to buy a $100 portion. I wish there was, but I’m not aware of a source. Hopefully, they will start breaking it into smaller portions for homebrewers if enough of us ask! You can always go in on it with some friends if that’s an option. Your local homebrew shop should be able to order it from Scott Labs. Split it up between friends, 100 g is good for 260+ gallons based on Scottlab’s suggested dosing.